Liposuction is a cosmetic surgery operation that helps sculpt the body by removing fat from specific areas like the abdomen, hips, buttocks, thighs, knees, upper arms, chin, and neck. The fat is removed using a cannula (a hollow tube) and an aspirator (a suction device). Liposuction is not a substitute for dieting and exercise, but it can remove stubborn areas of fat that do not respond to traditional weight loss methods. Cosmeticium is one of the main clinics who offer liposuction surgery in İstanbul, Turkey. A surgical procedure that injects solution with medications for anesthesia and decreased blood loss. This procedure is performed using a special cannula which uses tiny, rapid vibrations to break up fat cells so that they can be suctioned out of the body. The benefit of this procedure includes smaller incisions targeting specific areas without damaging the surrounding tissue. This technique uses ultrasonic waves to liquefy the fat in a targeted area that is later removed with a cannula. This procedure focuses low energy waves delivered by a thin laser fiber that is inserted through small access sites. Then, laser energy is focused directly on the fatty area without damage to surrounding tissues; the fat is liquefied thus allowing for gentler fat removal using a smaller cannula. The time required to perform liposuction varies considerably, depending on the size of the area treated, the amount of fat being removed, the type of anesthesia used and the liposuction techniques which are selected. During the procedure, a medicated fluid (termed ‘wetting solution’) is first injected into the treatment areas before the fat is removed. This fluid allows for easy removal of fat, reduces blood loss, and assists in pain relief both during and after surgery. Next, a small incision is made, and a hollow tube is inserted into the fat layer under the skin. This tube, or ‘cannula’ is used to vacuum out excess fatty tissue. Several incision sites (‘ports’) may be required for larger treatment areas, in order to ensure a smooth result after surgery. Once the desired contour is obtained, a compressive garment is placed; this helps to minimize bruising and assists in patient comfort. Immediately following your surgery, you’ll receive liposuction compression garments to wear for the following 1 month. These garments help contain the fluids in the treatment area to diminish swelling, and maintain proper shape. Light forms of exercise are important during liposuction recovery. Taking gentle walks can help improve circulation in the treatment area and speed up healing. A cosmetic surgery procedure, liposuction removes excess fat deposits that sit between your muscles and your skin. Specific areas of the body are targeted to improve your body contours, resulting in cleaner lines and a more fine-tuned appearance. Patients find that they can enjoy a shapelier figure and a renewed sense of confidence in their looks as well. Are There Different Kinds of Lipo? Tumescent Lipo allows for larger amounts of fat removal, with less bruising and swelling than traditional methods. Ultrasonic-Assisted Lipo (UAL) utilizes sound waves to break up and liquefy fat deposits in trouble spots. 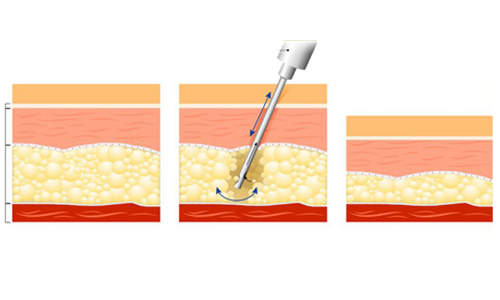 Power-Assisted Lipo (PAL) allows deeper tissue penetration through the use of a vibrating surgical wand. Liposuction eliminates stubborn fat pockets that can make your body look out of proportion. In many cases, lipo does what diet and exercise alone cannot. The end result is a smooth and sculpted contour. Also, unlike more involved procedures such as a tummy tuck (abdominoplasty), liposuction is a relatively quick procedure with a rapid recovery time. Is Lipo Like Weight Loss? Although liposuction does even out your shape, it is not a replacement for a healthful diet and regular exercise. Liposuction is designed for patients who already enjoy a healthy lifestyle, yet are struggling with a few remaining fat deposits. Lipo is a toning procedure, not a weight loss alternative. Where Is Liposuction Most Effective? Popular sculpting areas women often choose are the neck, arms, abdomen, thighs and hips. Male patients typically want to improve the appearance of the love handles, abdomen, chin and neck areas. During an initial consultation, our surgical team works with you to determine which fat deposits to eliminate for ideal results. Patients considering liposuction should be in good health and overall good shape, with just a few trouble spots of unwanted fat. Stubborn love handles are a good example of an area that can be reshaped with lipo. However, it’s important to keep realistic expectations. This procedure can sculpt your body, but it can’t help you become healthier or lose weight. Although every patient is different, most are generally ready to return to a light activity schedule a few days after their procedure. Stitches come out within the first week, and more involved activities can be resumed a few short weeks later. At first, to help reduce swelling, patients will wear a compression garment as the body heals. Since the surgical wand used during the procedure is quite small, only a few very tiny incisions are needed. Physical appearance will be toned and natural-looking in patients with good skin elasticity. It’s our goal to keep scarring to an absolute minimum. Liposuction will sculpt the body into more aesthetically pleasing contours, but since it may not minimize the appearance of cellulite, patients should not choose liposuction solely for that purpose. Radiofrequency skin tightening or using a needle to cut tethering bands can be effective solutions for cellulite. Once fat cells are removed from the body, they are permanently gone. It may take up to six months for the final results to show as your body adjusts to its new shape, but some degree of improvement will be noticeable immediately. If you gain weight after liposuction, the treated areas will retain a better shape than they would have if you had never gotten the procedure. How long is the recovery for liposuction? The recovery from liposuction is rapid. Typically a day or two away from work is enough for most patients. Dramatic improvements are usually noticeable immediately. The results get even better with time and are usually final about 6 months following surgery.